» Can Cats Eat Spinach? While cats are carnivores and fare best on a diet made up primarily of meat, a little vegetable once and a while certainly won’t hurt. However, not all vegetables are safe for cats to eat. Some vegetables, such as hot peppers, are absolutely unsafe for cats, while others such as peas, celery, and carrots are almost always harmless. But can cats eat spinach? Spinach is a little tricky. While spinach is usually nontoxic for cats in small amounts, you need to be very careful and shouldn’t purposefully feed spinach to your cat. Spinach is a leafy vegetable that is popular in all types of cuisines. While it is thought to have originally been cultivated in ancient Persia, it has found its way all over the globe and can be found pretty much anywhere in the world. Spinach has really made comeback in the past 15 years or so. We blend it in smoothies, throw it in a salad, and even put it in pasta and meat dishes. Unfortunately, you really shouldn’t share your spinach with your feline friend. While spinach may seem innocuous enough, it actually contains a compound called “calcium oxalate” which can cause crystals to form in your cat’s urinary tract. If enough of these crystals form they can cause bladder stones to form, which can create a number of health problems for your cat. Does this cat like spinach? We can’t tell…. There’s no need to panic if your cat gets a hold of a little bit of spinach. It would take feeding your cat spinach every day for long periods of time in order for them to consume enough calcium oxalate to make them sick. If you see your cat displaying any of these behaviors it’s best to bring them to the vet for a check-up, and stop feeding your cat spinach immediately. While spinach does contain a variety of vitamins and minerals that are healthy for cats, it’s simply not worth the risk. No, kittens absolutely cannot eat spinach. First of all, there is rarely any good reason to give your kitten “people food”. 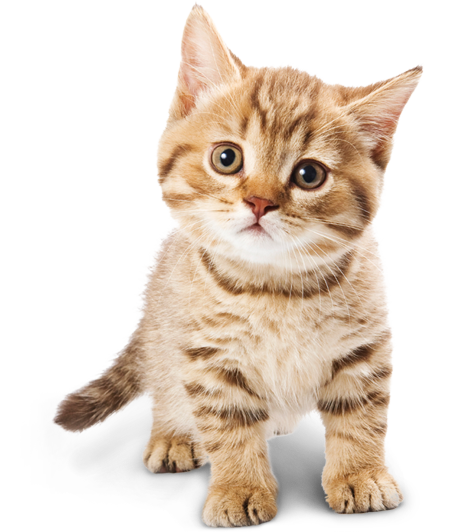 Kittens are going through a period of rapid growth and rely on you, their owner, to give them the best nutritional start available. Your best bet is to feed your kitten exclusively a diet of health kitten food, such as Blue Kitten Healthy Growth, which is grain free and lists meat as the first ingredient. While you can add some safe vegetables to your kitten’s diet, such as peas, you should get your kitten used to eating plain cat food. If they get accustomed to eating too many goodies when they are young, they may become picky eaters as adults. Butters (yes, that’s his name) enjoys a spinach leaf once and a while. But he’s full grown and his owners only give him a tiny bit at a time! Still…we wish he’d give peas a chance. If you want to add some veggies to your cat’s daily routine, there are some vegetables that cats can safely consume on a regular basis. One great example is peas. Peas are generally well received by cats and can be mixed in with their wet or dry food. Carrots, as long as they are cut into very small pieces, are also a great choice. You can also try offering your kitty treats made especially for cats that include vegetables, such as Dr. Becker’s Veggie Bites. These treats are great because they are made mostly of vegetables but include just enough meat to make them enticing for your cat. Another great option is to feed your cat a cat food that contains vegetables. While many brands of cat food contain some sort of vegetable, they aren’t always the best quality (or the best choice of veggie). Look for foods that list high-quality vegetables, such as peas, as one of the first four ingredients, such as Weruva TruLuxe cat food with veggies. So, can cats eat spinach? While spinach in small quantities is unlikely to do your cat any harm, there is really no reason to offer it to them because it contains calcium oxalate, which can cause crystals to form in your cat’s urinary tract. Because there are plenty of vegetables that don’t contain this compound that you can feed your cat, there’s no reason to take the risk with spinach! And if you’re looking to find commercial cat treats that are made primarily of vegetables, you can try Dr. Becker’s Veggie Bites, which contain tons of veggie goodness. Does your cat love vegetables? What kind? If your cat loves spinach, how have you curbed their cravings with safer alternatives? We want to hear all about it- let us know in the comments!